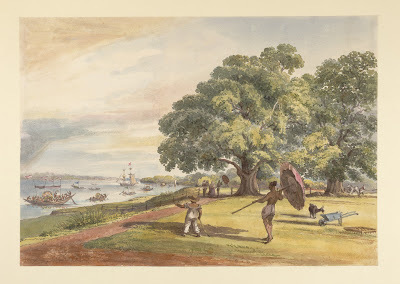 Pen and ink and watercolour by William Prinsep (1794-1874) of the garden at his brother Charles' house at Isherah in West Bengal, dated c. the 1830s. The image showing a small boy, with a servant carrying a sunshade, watching decorated boats on the river, is inscribed on the facing page of the original sketchbook: 'Charles's Garden at Isherah looking south'. Charles Robert was the second son of John Prinsep. He joined the Bar in Calcutta, in 1826 and was Advocate-General of Bengal, 1846, 1849 and 1852-1855. William Prinsep, an employee of the Calcutta firm Palmer & Co., came from a family who served in India for several generations. After the collapse of the above company he worked as an indigo broker, was on the board of the Assam Company and was credited with the establishment of the Indian Tea industry as well as establishing the Bengal Coal Company and inheriting the Bengal Salt Company on the death of his brother George.